Exhibit | Friends of Fort Caswell Rifle Range, Inc.
A recent visit to the North Carolina Museum of History’s exhibit “North Carolina & World War I” served as a reminder that honoring the sacrifices of the men and women of North Carolina is what energizes us to continue to work to stabilize the Fort Caswell Rifle Range. 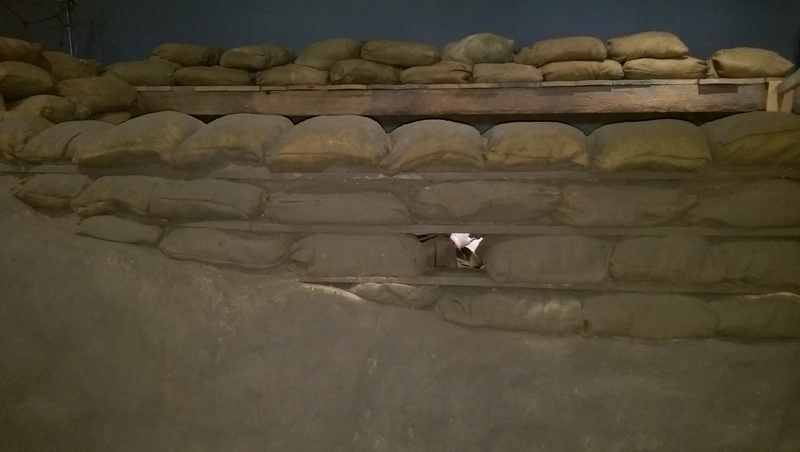 The exhibit is modeled after trenches and includes barbed wire, sandbags, and even (fake) rats. The low lights, noise of gunfire, exploding shells, screams, and sudden challenges shouted in various languages add to the realism. 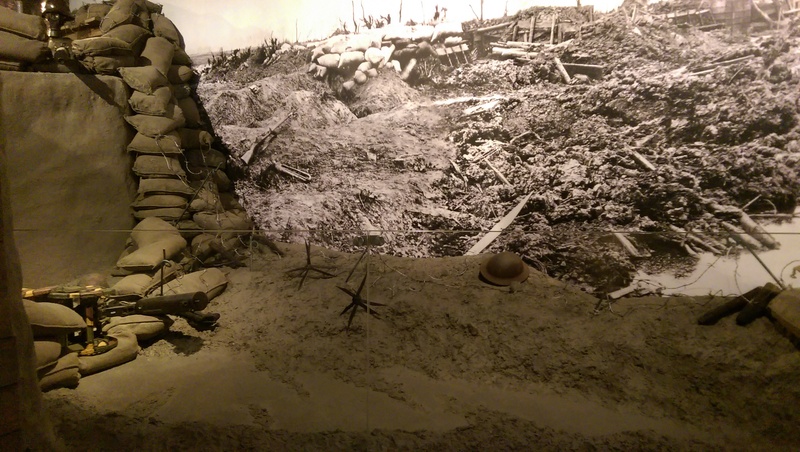 Displays of artifacts are seen while winding through the trenches. 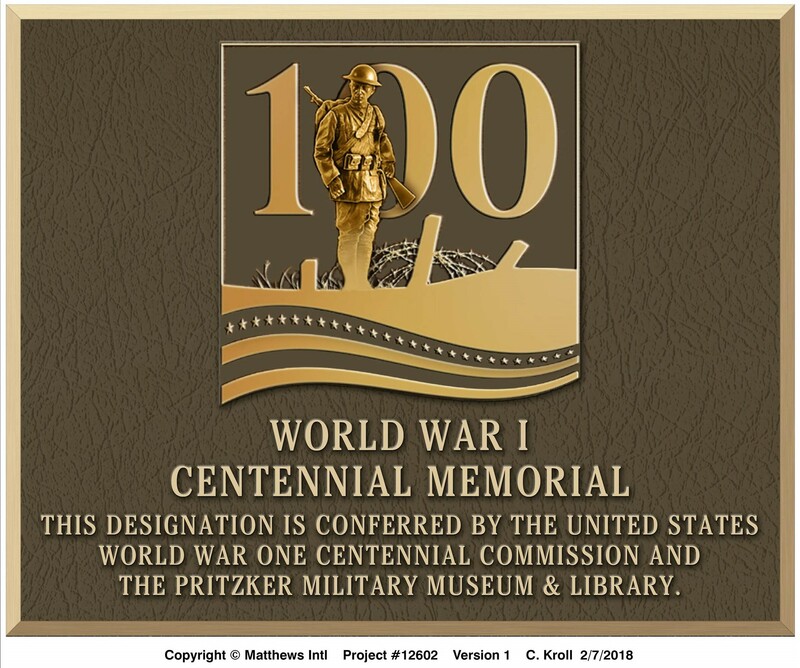 Many of these are uniforms, medals, letters written to loved ones, and various items once used by the men and women from North Carolina who joined the battle overseas. 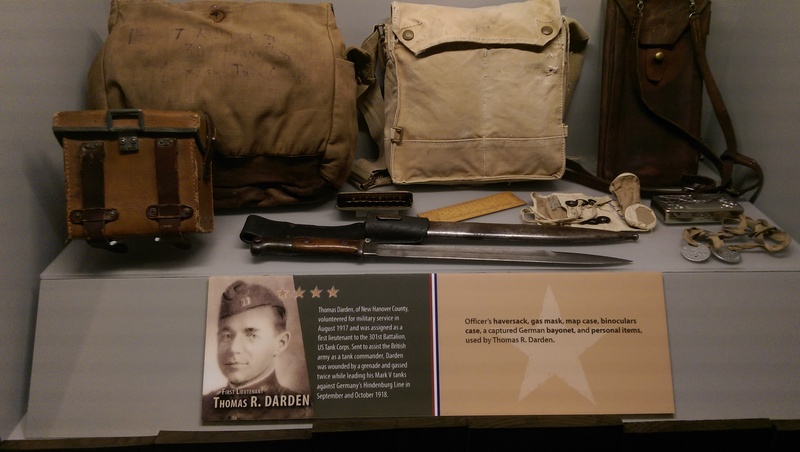 These items pictured were used by Thomas R. Darden of New Hanover County. 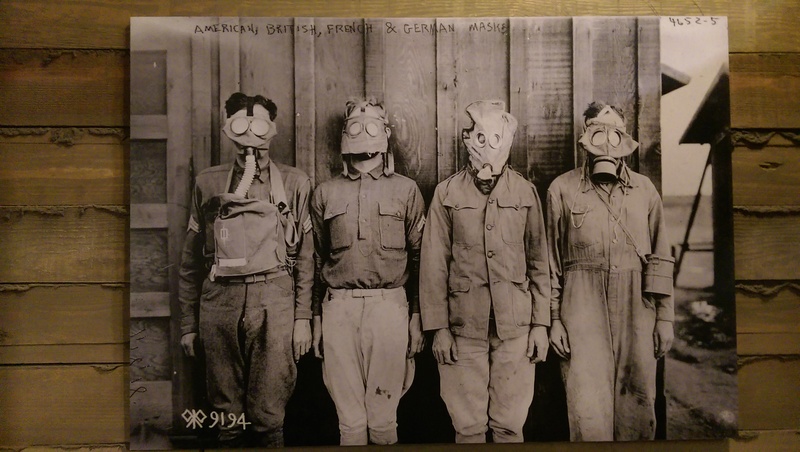 The story behind the creation of the exhibit is also interesting. 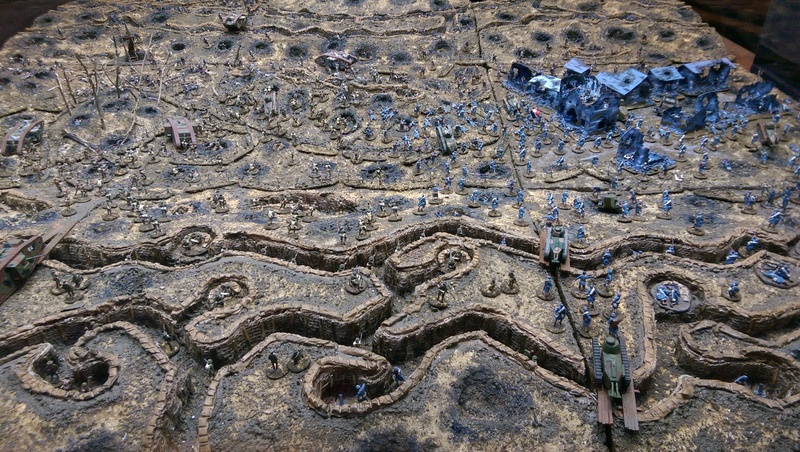 This diorama was a war game that Jackson Marshall, deputy director, project manager, and exhibit curator at the museum, built with his two sons who were fascinated by WWI and traveled with him overseas to battlefields. Both also helped him build the exhibit. A group of home-schooled students and parents helped museum artist Robert Stone and his team fill the burlap sandbags that are stacked throughout the exhibit, some of which are real Army surplus. Many years ago, curator Jackson Marshall began gathering these stories that he eventually published in a book in 1998. The veterans’ biggest fear: that they would simply be forgotten. The Barbee Library on Oak Island has an exhibit from the Historic Wilmington Foundation of the 8 Most Threatened Historic Places in the Cape Fear Region. Shown are exceptional pictures, text about the sites, a map identifying the sites, and other interesting info. The display will be there two more weeks. 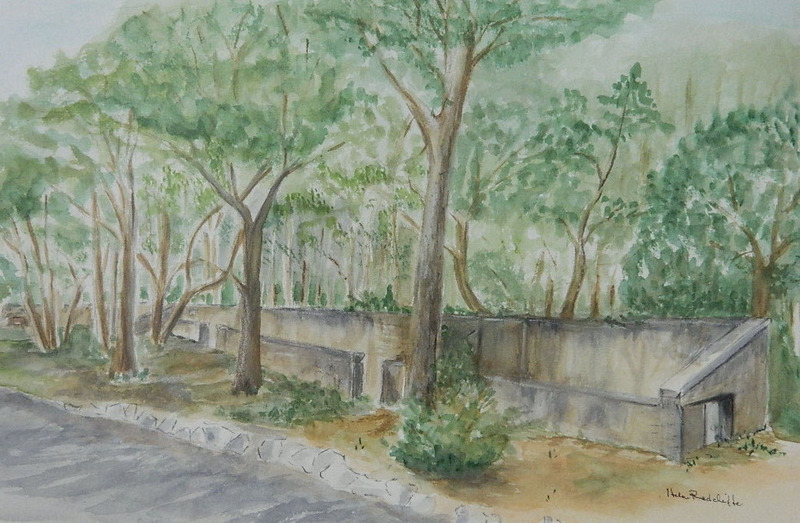 Look for Fort Caswell Rifle Range!